I gave this TEDx talk in Zurich back in October. It was released online today. 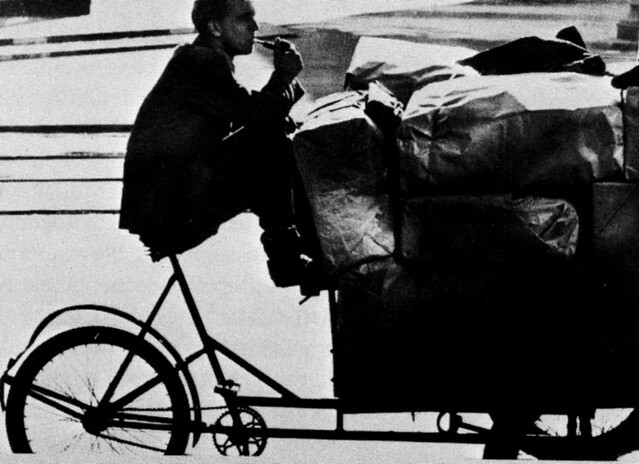 Bicycle Culture by Design - the abridged version. If anyone is interested, here's my script. Some deviations, but mostly the same as the talk. Hopefully, watching the TEDx talk is better than reading the words, but hey. But I want to put the next 15 minutes into perspective and I need your help. I'd like everyone to clap at the same tempo as me. Not loud, just softly. Like this. Thank you. For every time we clapped our hands someone, somewhere in the world was injured in a car accident. 96 beats per minute. 50 million people a year are injured in car accidents. 1.2 million are killed by cars. In both the EU and the US 35.000 people are killed every year by cars. Do you know what that is? That's a 9/11 – collapsing World Trade Center towers every single month. And every month for the last 60 years - at least. I can't possibly be alone in thinking that this is insane. There is no war on this terror. We have accepted a status quo in our socities that is quite unacceptable. I wanted to find out why we had reached this point and, more importantly, what we could do to make things better and to think differetly. Let's look at the streets themselves. What are streets? For 7000 years since cities first were formed streets had a very singular definition. People gathered in them, transported themselves, sold their goods, children played in them. Streets were an extension of our homes and our living rooms. They were public domain. Probably the most democratic spaces in the history of homo sapiens. Now many people seem have a perception that streets are the sole and exclusive domain of automobiles. I discovered that two things happened to cause this massive paradigm shift in our perception of streets. Firstly, in the rapid urbanisation of the late 1800s and early 1900s engineers were the urban heroes of the day, tackling all the urban challenges thrown at them and doing it well. However, when the automobile appeared, people started dying and nobody had a solution to the accelerating traffic safety problem. Almost in desperation, engineers were handed the job, in collaboration with the automobile industry who saw an opportunity. Almost overnight, streets become regarded as public utilities, like water supply, electricity or sewers. Puzzles to be solved with mathematical equations. 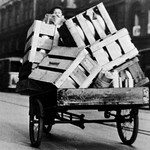 Secondly, the automobile industry had a problem. They had products to sell but people hated them. They employed effective tactics like marketing and ridicule to change peoples perception. 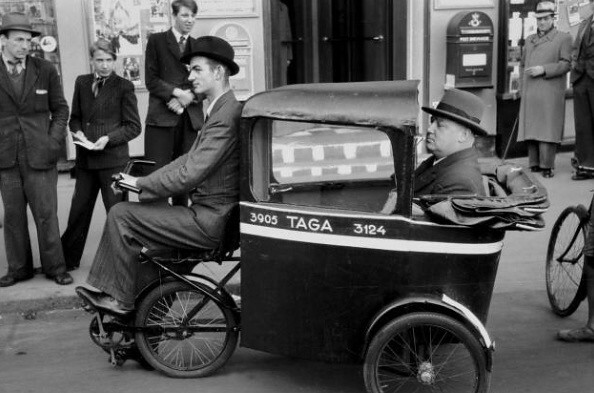 The automobile industry started campaigns against what they called jaywalking. In the American slang back then, a jay was a mocking term for a country bumpkin, who didn't know the ways of the big city. 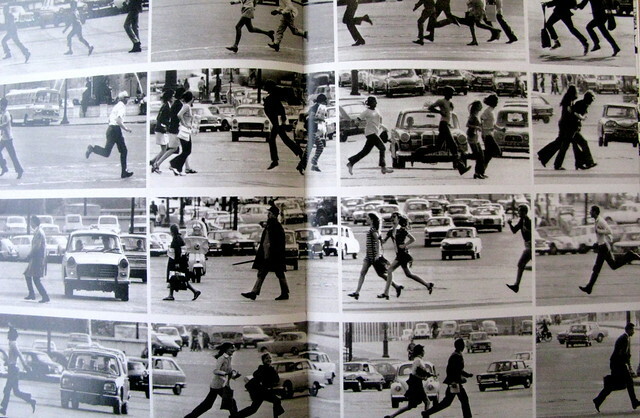 People were ridiculed for trying to cross the street in the middle of the block – a 7000 year old habit. Boy scouts were enlisted to hand out flyers chastising these people. 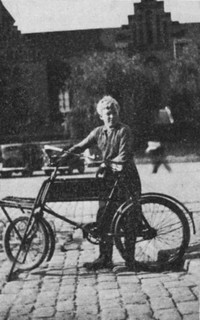 People who were against cars were labelled as old-fashioned and standing in the way of progress. This was all effective. Nobody likes to be called old fashioned or ridiculed. Pedestrians were herded into these crosswalk things. Children were shephereded into newly invented things called playgrounds and finally, these irritating obstacles were removed. The stage was set for a paradigm shift. Probably the greatest paradigm shift in the history of our cities. And here we are. Welcome to the tail-end of 100 years of traffic engineering where science was applied to social planning and human streets – for the first time in 7000 years. No one has figured out how to make traffic flow better or ease congestion. Not to mention stop alot of people from getting killed and injured. Streets now carve up cities like angry rivers slicing through sand. What's more is that traffic engineering is largely unchanged since about 1935. Sure, there is more technology for gathering data and analysing it, but the mindset hasn't evolved. Imagine if education, health care, parenting, architecture, design... you name it... was stuck in 1935? What a world. And yet we continue to fund it in its current form. We're living in cities controlled by bizarre, often outdated mathematical models and equations, impact assessments, cost-benefit analyses. Even lovely cities like Copenhagen or Zurich. It sometimes feels like we're all characters in The Matrix. Cities around the world can't even put in a separated cycle track, widen a sidewalk, implement traffic calming measures or lower speed limits – because it doesn't fit into some computer-generated mathematical model down in the engineering department. Is there a way out of The Matrix? Urbanization is on the rise again, now more than ever. We need new solutions in a hurry. Should we really be engineering something as organic and human as urban streets? It's the people in a city who define it. Shouldn't we be studying their behaviour, their patterns and movements, desires and needs, in order to understand how to develop our cities? It worked for 7000 years. There's a pretty good chance it'll work again. There are two things we need. One is something we all share. Basic human observation. In 1958, the French philosopher Gaston Bachelard described the idea of Desire Lines. 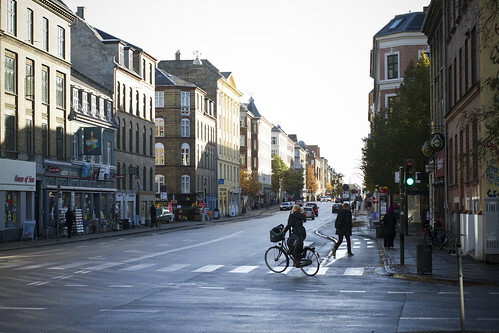 For example, this is a street corner in Copenhagen. On the busiest bicycle street in the world. 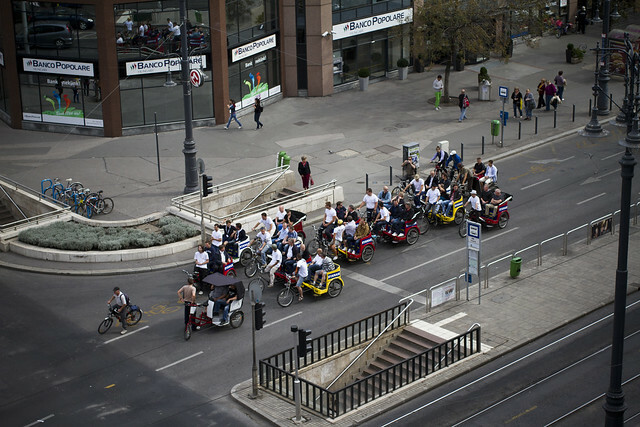 The city discovered that several hundred cyclists were riding over the sidewalk to get to a parallel street. Instead of handing out tickets all day long, they observed. Accepting that there was probably a very good reason for this. A temporary cycle track was put in and, later, it was made permanent. The sub-conscious desire lines of the citizen cyclists were respected. This is the view from my hotel room in Halifax, Canada earlier this year. Fresh snow on the Commons, the public park in the heart of the city. The green lines are the original pathways, perfect for 19th century promenading. 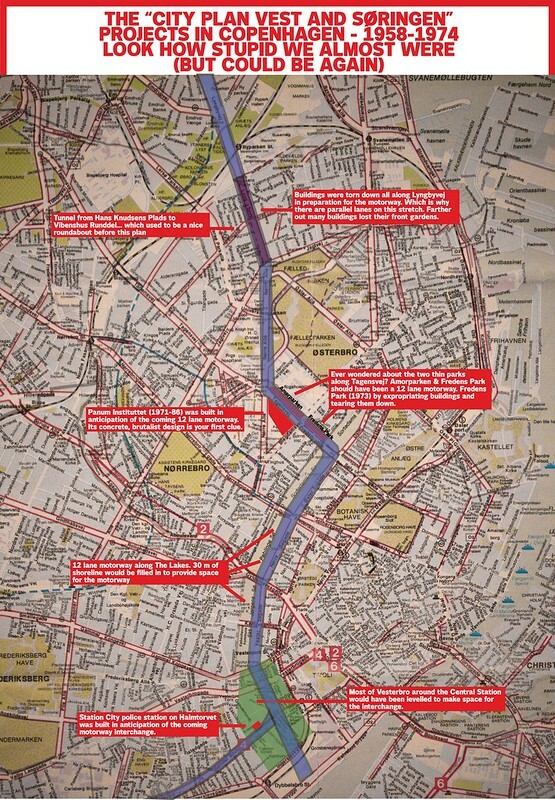 But the red lines are where the people actually walked and biked in the morning rush hour. Perfectly carved desire lines through the snow. A modern city watches... and redesigns accordingly. We love desire lines at my company. We filmed an intersection in Copenhagen for 12 hours one random day in April. Mapping the desire lines of every single one of the 16,558 cyclists who passed by. And that's not even a busy intersection for bicycles in Copenhagen. I can tell you that no mathematical model can replace 12 hours of intense human observation when you're searching for new, modern, urban solutions. In my work developing bicycle infrastructure and culture in cities around the world I am constantly amazed at how few planners and engineers have actually tried to ride a bicycle in their city – or even spent any serious time as a pedestrian. It's all maps, data, traffic flow. Come on... Designing bicycle infrastructure without having tried to ride a bike is simply not possible. Here's the second key to modernising our cities. Something we all know well. We all have a relationship with design. We're all designers. And a designer thinks differently. They place themselves in the mind of the user of the product. That human being at the other end of the design process. They think about functionality, useability and user-friendliness. They work with concepts like the Four Types of Pleasure. Physio, Socio, Pyscho and Ideo-pleasure. Designing a city for pedestrians or cyclists – or any aspect of a liveable city – should be like designing for any other product on the market. It should be like designing a chair. When you all came in here you sat down. It was esay and intuitive. 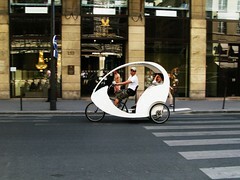 Imagine if riding a bicycle or walking in a city was that easy and intuitive. Design is also a powerful tool if applied correctly. It can be seductive, too. Making us forget price and perfomance. 80% of us don't actually need that smartphone in our pockets. But my goodness we saved up and hurried down to buy it. Seduced by design. Safe, well-designed bicycle infrastructure seduces people to use it. 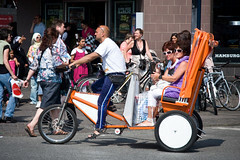 Make the bicycle the quickest and easiest way from A to B and people will ride. 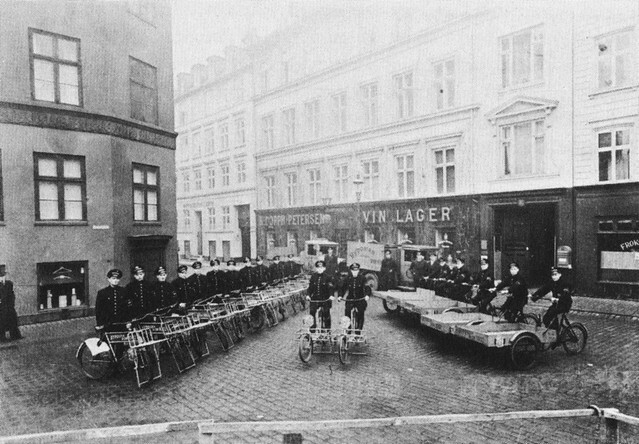 They did for decades – every city in the world was a bicycle city back in the day. Good design also improves human behaviour. I hear the same thing all over the world. Those damn cyclists. Breaking the law, running red lights, riding on sidewalks. Shaking the very foundations of our society with their behaviour. Well, I have one, simple response to that. Those cyclists haven't been given adequate infrastructure – or worse... none at all. Not to mention the fact that they are forced to abide by car-centric laws. 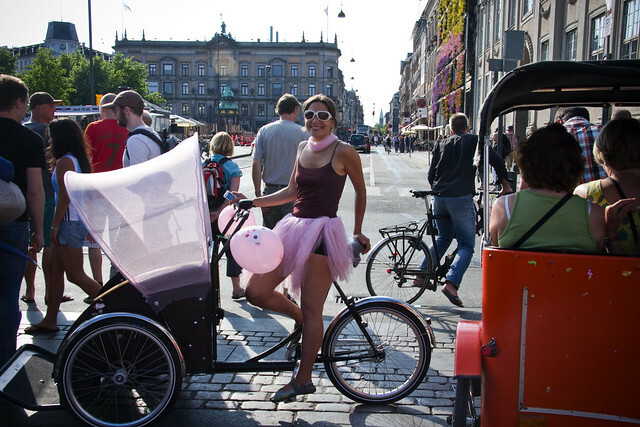 But in the morning rush hour in Copenhagen when a few hundred thousand people ride a bicycle to work, it's different. A hundred or so cyclists at each traffic light cycle.... wait for the light to change. Because they're on well-designed infrastructure. Citizens don't want to break laws but they will react positively or negatively to urban design. They will also micro-design for us, if given the chance. 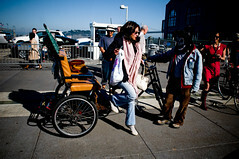 With their desire lines and other ways of expressing their needs. The foundations of the good cities of the future must be built on human observation – anthropology and sociology – and design. As well as listening carefully to the thoughts and observations of the leading minds in the field. Lulu-Sophia has a brother. Felix. He's ten. I thought it would be interesting to get his third grade class to redesign the roundabout outside their school. A badly engineered roundabout. Without too much input from me, they went to work. 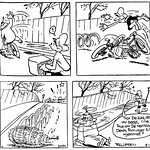 Apart from wanting glass roofs over the cycle tracks so they wouldn't get wet... most of their ideas were great. And rational. Based on experience and human needs. When you think like rational, logical children, you free your mind. The idea of glass roofs was funny. But in cities in the Netherlands they are installing rain sensors on the bicycle traffic lights. When it rains, cyclists get priority at intersections. 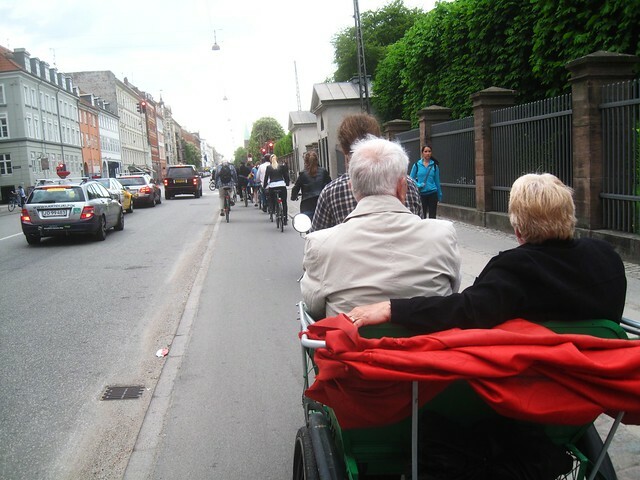 In Copenhagen on the main arteries leading to the city a Green Wave is in place. Ride 20 km/h and you hit green lights all the way to work. 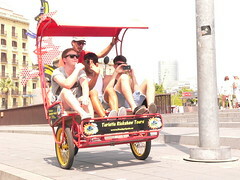 On bicycles. 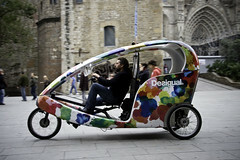 What would the streets of a city be like if a team of five year olds, third graders and young design students be like? They would be beautiful. They would be safe.. And you know what... they would work. I'll tell you what's old fashioned and standing in the way of progress. Engineering cities instead of designing them. But you know what? This is not all about bicycle infrastructure, pedestrian facilities, traffic calming, urban design. This is about erecting monuments. Monuments that we the people design and erect. To liveable cities. Monuments to the past, present and the all important future. Monuments that make cities better. Saving lives instead of destryong them or wiping them out. We are the architects. We are the designers. These are our cities. I'll leave you with this quote. Cities are erected on spiritual columns. Like giant mirrors they reflect the hearts of their residents. If those hearts darken and lose faith, cities will lose their glamour. A 900 year old quote. More true today than ever before. Let's make our cities and hearts shine. Let's take this paradigm and shift it. Back where it belongs. Back to the future. Let's allow these monuments to rise all over the world. Harbour Tunnel or a Better City? Fellini's 8 1/2 was a comedy. Kind of like Copenhagen City Hall at the moment. Despite the fact that the only damned thing we know from a century of traffic engineering is that when you create more space for cars, more cars appear. See a vision of City Hall's tunnel here. Lars Barfred, who writes here on the site, has done some rational calculations. For about the same price as a ridiculous harbour tunnel, we could have things we ACTUALLY NEED. 3 billion: Fully automated S-Train system with trains every 5 minutes on all the lines with stops at all stations. What city would you rather live in? One that builds last-century Soviet style tunnels or one that provides you with the list, above? Or rather... which politicians would you vote for here in 2012? Tunnel rats or visionaries? The 15th Percentile - Survival of the Fittest? We recently covered the disturbing and archaeic 85th percentile method and how it is applied for (and by) vehicles. If you thought THAT was fun, you might also enjoy The 15th Percentile. 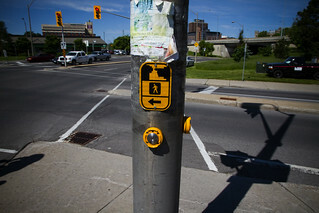 It is frequently used to determine the time between the WALK and DON'T WALK crossing signals - in other words, how much time the engineers computer models allow for human beings to cross streets. It's not as rooted as a standard as The 85th Percentile, but it is still widespread. In a nutshell, we should be paying more attention to pedestrian crossings, when you consider statistics that say that "40% of accidents involving pedestrians occur at these intersections". 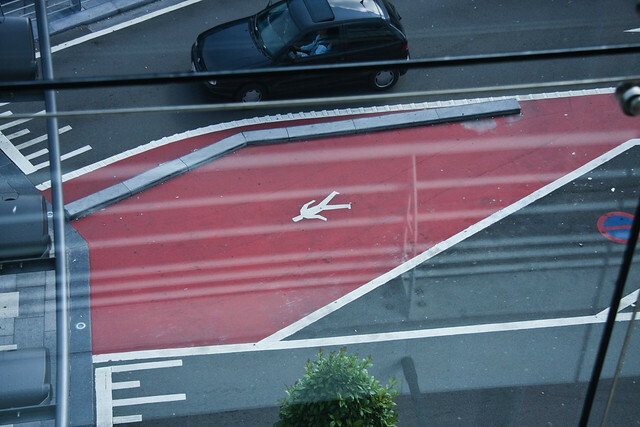 In Europe, one in four pedestrians die on a crossing. What seems to be the problem? In the U.S., the Manual on Uniform Traffic Control Devices (MUTCD) establishes a “normal” pedestrian speed at 1.2 metres per second (m/s), so traffic signal times are set according to that speed. It is also an international standard. One of the first things that popped into my head was: “what about the most vulnerable groups such as children or the elderly?”. After analysing several published studies, children didn't appear to be the most problematic group – at least when it comes to their crossing times. Instead it is the elderly that are a cause for alarm. 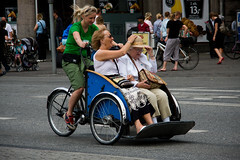 The elderly have different 15th Percentile speeds than younger pedestrians, but it is still widely recognized that the the crossing time for older pedestrians is insufficient. In other words, 1.2 m/s simply isn't enough for older people to cross a street. Which, of course, means that it is not a very good standard, especially considering that our population is growing older and older. It's a standard that can lead to increaed death and serious injury. Once again, we've made the mistake of allowing ourselves to be controlled by machines, like numbers. We know all too well that this has been proven to be insufficient in protecting pedestrians and cyclists, among others. The fact that 1.2 m/s is not a speed for everyone has proved to be common knowledge. 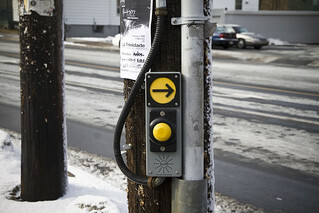 For instance, the Institute for Transportation Engineers is aware of the fact that "(...) the majority of traffic signals [in the U.S.] are timed so that up to half of pedestrians beginning to cross at the start of the clearance interval potentially will be in the street when conflicting traffic is free to proceed." Even the MUTCD raised awareness about this by saying that a speed lower than 1.2 m/s should be considered when pedestrians with slower speeds routinely use crossings. So, if establishing a traffic signal time limit by the 15th percentile will give slower speeds than the average ones, the theory should be right, no? Then why are so many people getting injured or killed in the place where they should be protected the most - when crossing a road? The simple answer: The 15th Percentile is still not enough to solve the problem for slower pedestrians. 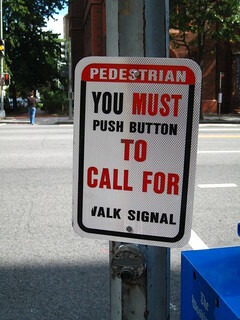 Confusing signals for pedestrians. 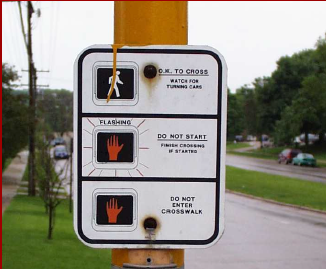 In the U.S., 50% of pedestrians, don't understand that the red “Flashing Don't Walk” sign means that you may continue crossing. Of course they (including me) don't understand: it's because it is confusing. Farther down you'll find particular cases around the world. The stop line for cars is too close to the pedestrian crossings. This one goes without saying. Drivers running red lights. It's obvious but I don't understand how this still happens these days. Not every sign respects the average speed of the pedestrian. 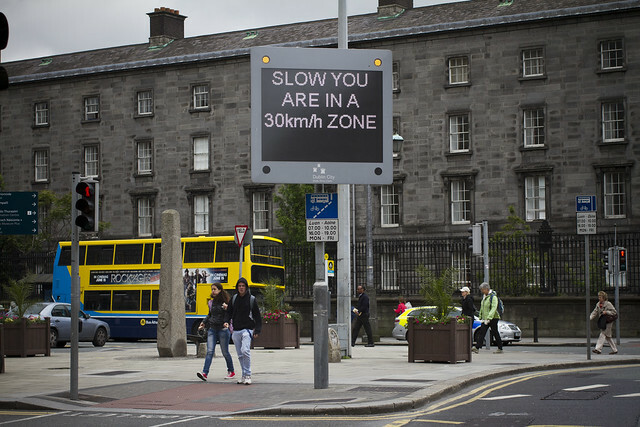 Let's admit for one second that the average speed is 1.2 m/s, regardless of the group of pedestrians. Not every pedestrian crossing signal respects that speed. How many of us had to almost run in some crossings just to arrive safely on the other side? There's also probably a lack of inspection going on in some cases. 0.9 m/s should be the speed set for the average pedestrian – according to previously cited studies. 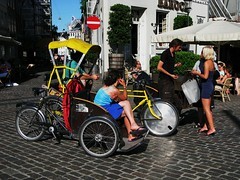 This would allow the accommodation of all types of pedestrian groups. Several studies (linked here, here and here) have also pointed out that this is the speed for older pedestrians. The time gap between the red signal for pedestrians and green one for cars should be much longer, in some cases. In the U.S., a crossing with some instructions for pedestrians. Without sounding paranoid, are we moving towards a mandatory walking licence? «The use of the flags did not seem to have a significant effect on driver behaviour». Nevertheless, other cities in the US have pedestrian flags in place. Seriously. 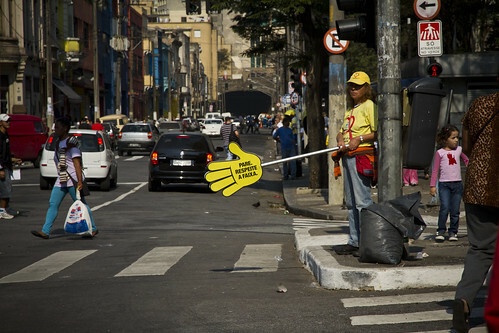 In São Paulo, Brazil, people help drivers slow down, in order to help people crossing the street. In fact, most drivers don’t respect crosswalks there. This is a very noble initiative but it still states clearly that the car rules the streets. Reducing car speeds would make this unnecessary. The last image is very peculiar. Not only the streets don’t belong to pedestrians but now we have to submit to the power of the car (“THOU SHALL NOT PASS”?). 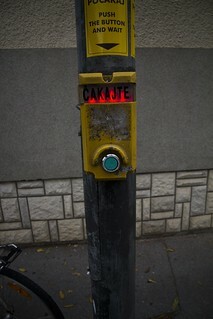 Generally, these pedestrian buttons (or even for cyclists like they have in the Netherlands), require human beings to push a button and wait for the mercy of an engineered computer programme to grant them permission to enter the roadway. When do you we ever require motorists to stop, roll down the window and press a button before crossing an intersection? This recent news item from Stoke, UK shows how ridiculous some city councils can be. A spokesman actually says, "it was not that the crossing was not working properly, it was just that people were not using it correctly." So the council will hire people to stand in the crossing and "educate" pedestrians about how to use the badly designed crossing. These two signs are the scariest ones: the first one shows a running pedestrian – I'm tired just looking at it.On the second one you have a countdown clock stressing you. The bad thing is that they assume your speed will be (at the very least) 1.2 m/s. Nevertheless, these examples show some kind of effort, but they are measures to avoid addressing the bigger problem: cars. The cars remain untouchable. But we still have an elephant in the room - a bull in the china shop - and the above measures are directed to avoid him while he's walking there. 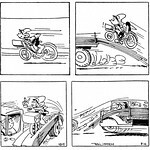 In this case, the elephant is the car – and the (almost) subsequent excess of speed by the driver. Reducing speeds in streets would help tackle pedestrian safety in a greater way. Also, citizens’ initiatives are the most powerful and effective work-force, in my opinion. They should have a bigger role, considering they are the biggest stakeholders when in comes to traffic safety. At the end of the day, it's funny that there are engineers entirely responsible for the free flow of vehicular traffic movement, but we don't have the equivalent for pedestrians. Sure, engineers who should be responsible for the free flow of pedestrians. Including their safety, of course. All in all, The 15th Percentile method doesn't seem that bad at first sight. However, it still fails to protect everyone due to the fact that the elderly are slower walkers. We're still making the same mistake as ever: thinking of people as numbers. They (we) aren't. But today's pedestrian crossings show that you have to be fit, be 100% aware, be literate. Basically, you have to be a "perfect robot" and adapt. 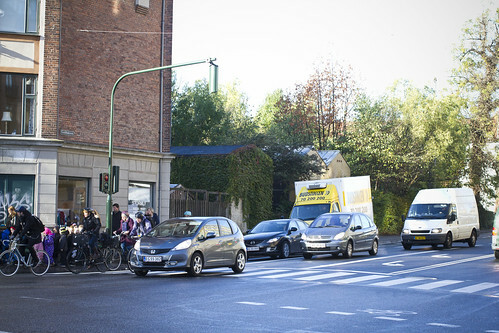 Adapt to traffic, adapt to cars, adapt to signals and adapt to crossings. It's Darwin's natural selection: the survival of the fittest. 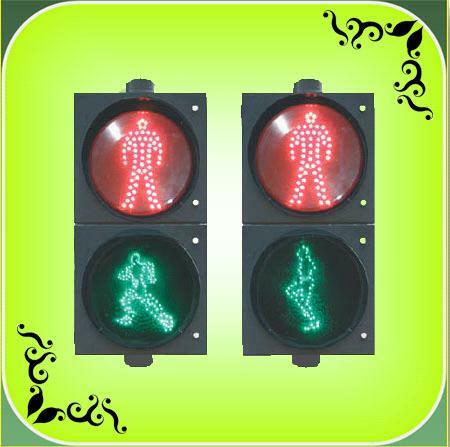 PS: If you know any absurd activity on crossings for pedestrians, please share with us. 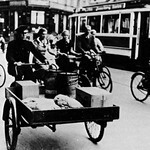 Here are some historical photos of a cargo bike life in Copenhagen. 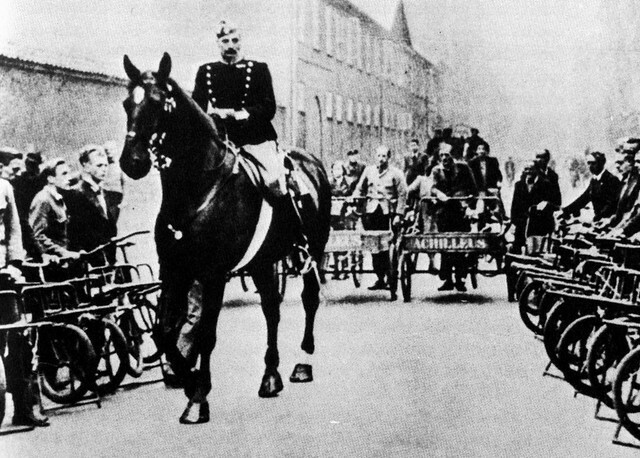 Above, King Christian X on one of his daily rides through the streets during the Second World War occupation. 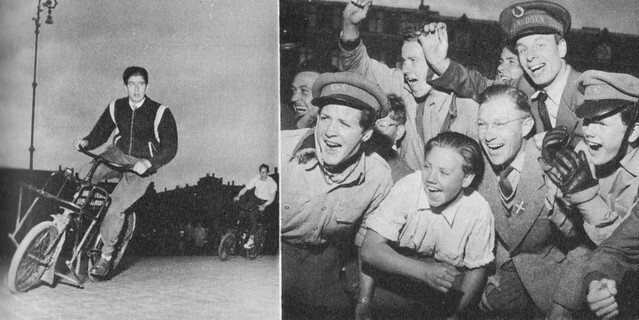 He always rode without official guards through the streets and was much loved for it. Here, however, he was guarded by the bicycle messengers from the company Achilleus. 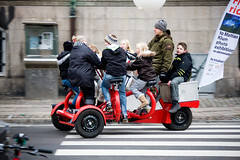 Here is a link to an earlier post about the Svajere - or cargo bike messengers of Copenhagen. 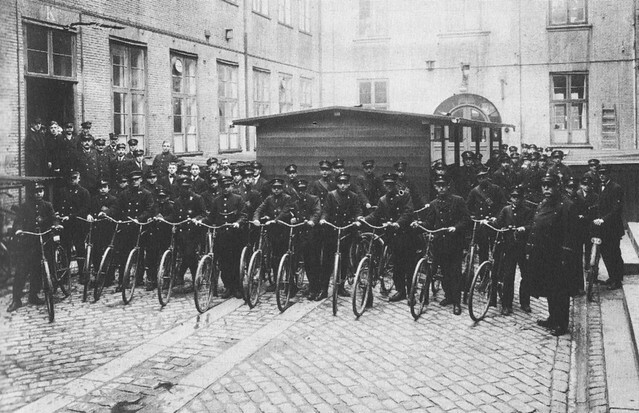 The bicycle messengers at the headquarters of the Post & Telegraf service in 1917. Dressed splendidly. 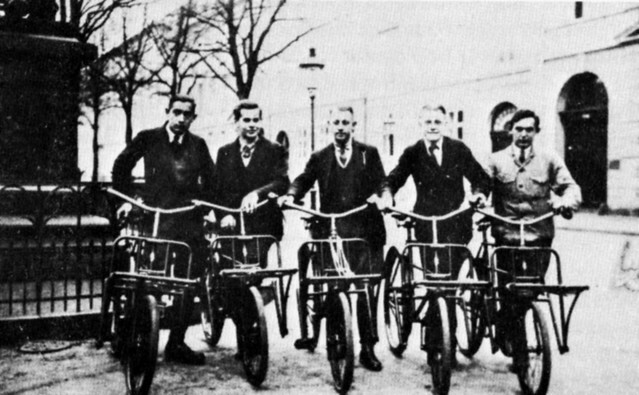 The bike messengers - or Svajere - in official service were usually uniformed until the end of the 1940s, when casual wear became the norm. 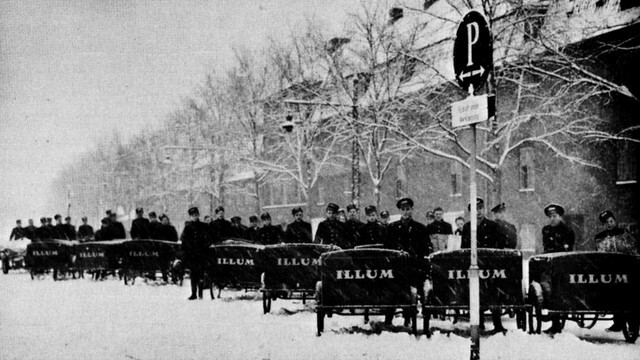 The bicycle messengers for Illum department store in the 1940s, during the occupation. 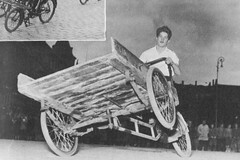 A double cargo bike nicknamed Skildpadden - or The Turtle - in the service of Illum department store. 1940s. 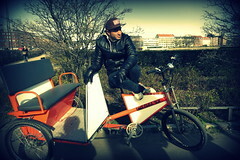 The bike messenger team at Byposten messenger company. 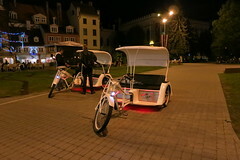 Bicycle messengers from the telegraf service lined up on City Hall Square. 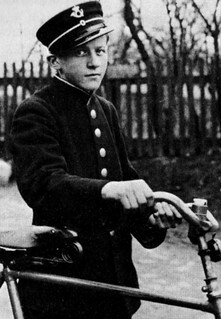 Young bicycle messengers. Ca. 1940s at left and 1941 at right. 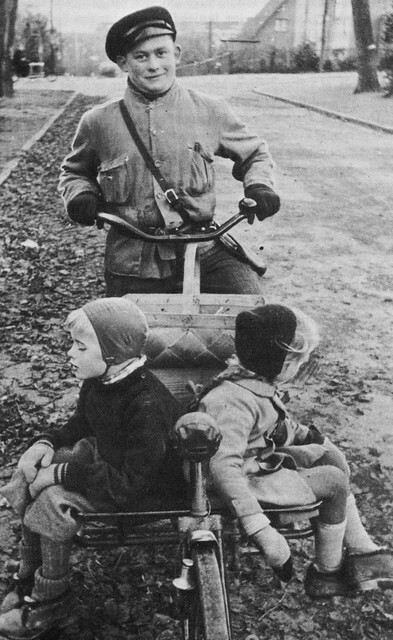 A "svajer" giving free rides to kids in the neighbourhood, 1942. 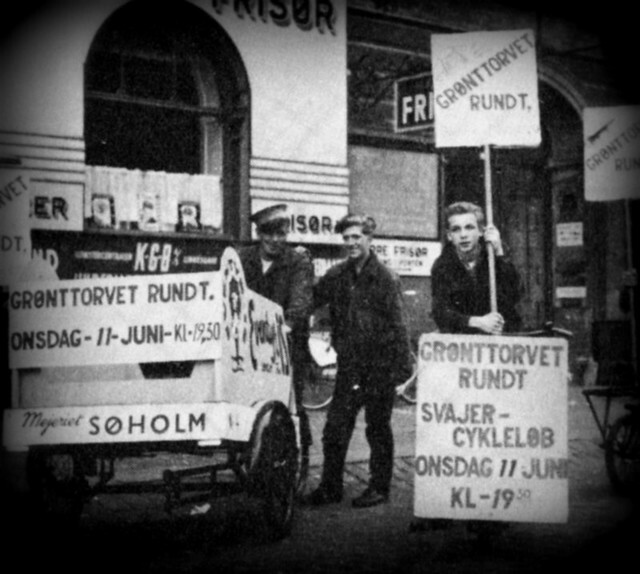 The legendary Svajerløb on Grønttorvet - now Israels Square. 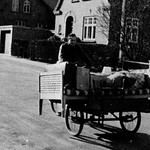 The races were organised by a man with a messenger company and the money raised was used to send the young bike messengers to summer camp. 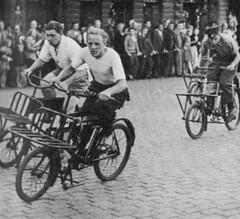 The races were popular events in Copenhagen. They were revived in 2009. More about the Svajere - then and now - right here. 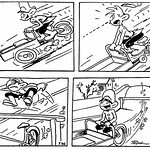 Cartoons about the feisty bike messengers. A quiet moment with a pipe. Mix it all up and let people's inertia do the rest. Lisbon's Blood Vessels – A mapping experiment from Pedro Miguel Cruz on Vimeo. Bon appetit. We should experience an heart attack at any minute now. 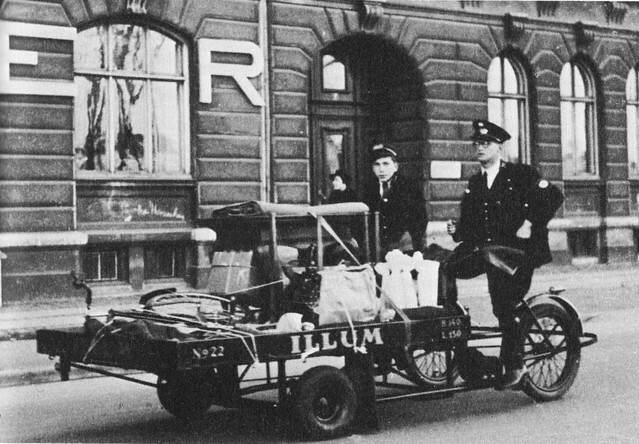 Erik Griswold, one of our team members here at Copenhagenize, found some retro photos of Copenhagen. More specifically, Frederiksberg. Even more specifically, my front door. I promptly went out and took photos from the same angle. The couple of steps at the bottom right of the 1960s photo, below, are the main door to my building. Interesting to learn that back then I would have had the penthouse flat, because since then someone added some floors. What I find most interesting is the comparison of the two photos. 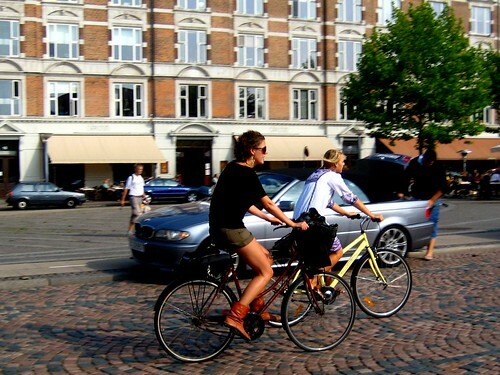 While it is certainly true that road space and parking for cars were removed in Copenhagen to reestablish the bicycle infrastructure back in the early 1980s, it's plain to see that space - on certain streets - was reclaimed from other sources, as well. Look at the paving stones outside my door in the modern photo, at right. There's some asphalt and then two rows of paving stones. 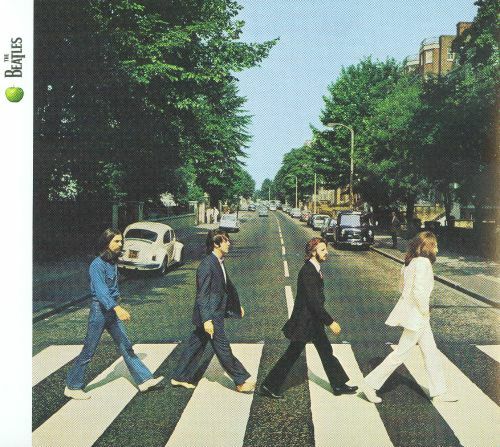 In the vintage photo, the sidewalk is four paving stones wide, narrowing a bit in the distance because of car parking. Nevertheless, the sidewalks were much wider. As a daily user of this sidewalk, I'd like that width back, please. You can see that the space for the cycle track was taken from a combination of the sidewalk space and the car parking. Shrinking sidewalks are hardly an unusual phenomenon. 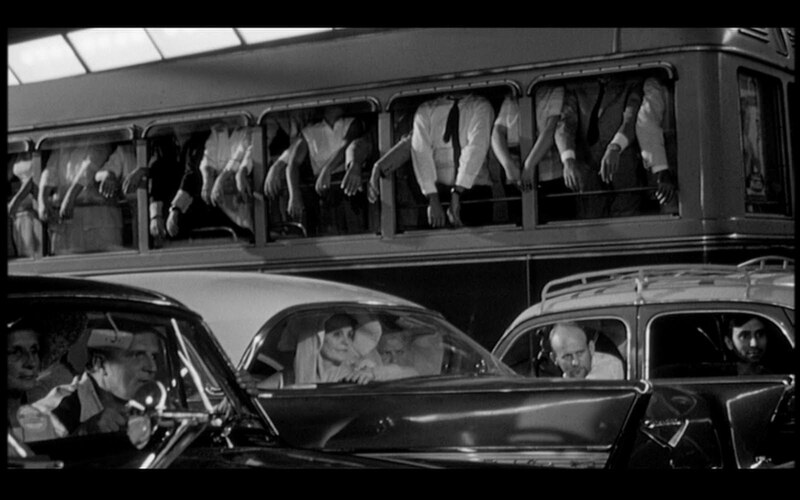 They shrunk all over the world with the advent of car culture. Space was needed and sidewalks were traditionally, in many cities, very wide. In my city, there are places where they are now obscenely narrow, as we wrote about recently. Although it's harder to see, it does however look like the sidewalk on the left side of the street is about the same. Doesn't mean it wasn't expropriated for car space - just means it was probably done earlier. It would be brilliant if those trams were still rolling up and down the street, though. 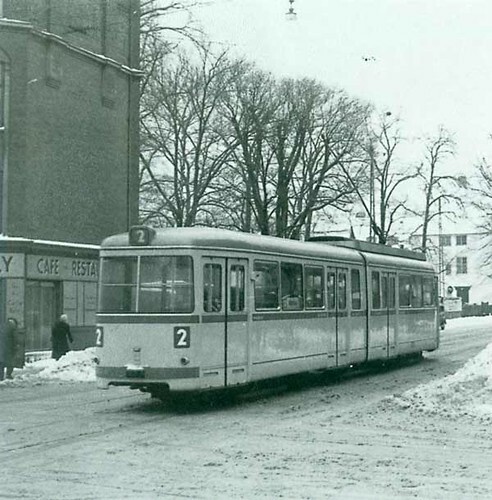 But despite the fact that cities all over Europe are establishing or reestablishing tramway networks, no politician in Copenhagen is in that modern loop. Here's the opposite corner. Nothing startling to report here. Except that cycle tracks now occupy the space taken up by those piles of snow. And they are kept clear of snow, of course. A couple of twists of fate and this location in Copenhagen would have been a 12 lane motorway. When looking back over the last century of cities infatuated with Car Culture, it's not hard to see how stupid we were - or almost were. 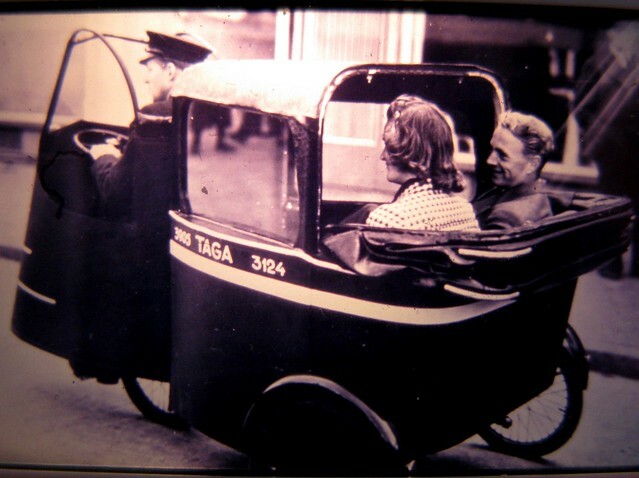 In the 1940s the so-called Finger Plan was developed for Copenhagen. By and large an interesting concept and the foundation for the expansion of Copenhagen. The Finger Plan has, however, some dark secrets. Among them are two connected projects. City Plan Vest (City Plan West) and Søringen (The Lake Ring). The City Plan Vest, in 1958, proposed that Copenhagen be equipped with a Lake Ring. 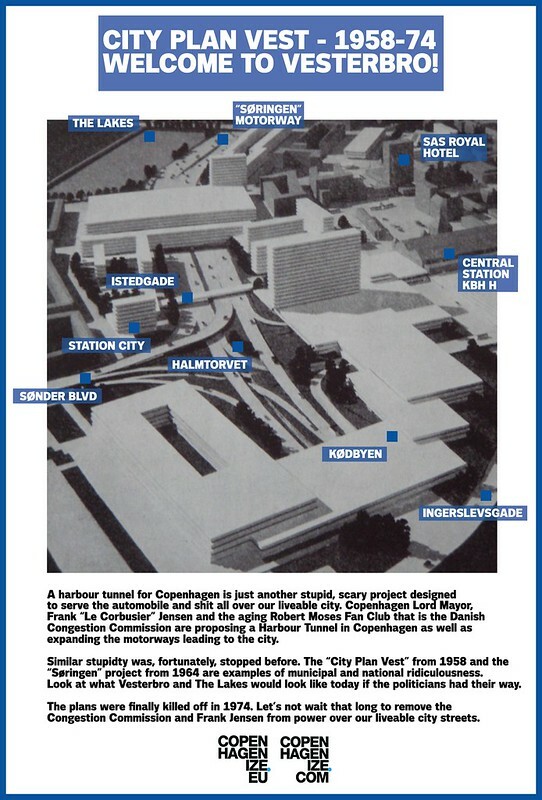 The #19 motorway from the north would continue over Hans Knudsens Plads - in a tunnel to Vibenshus Runddel - and then emerging again to continue along Nørre Allé in a 12 lane motorway down Tagensvej and Fredensgade. It would turn right along The Lakes to Vesterbro, where a comprehensive interchange would be built to lead traffic to the south towards Germany and the rest of Europe. The Søringen project was approved by parliament in 1964. It involved expropriating and filling in a swath of The Lakes to make space for the 12 lanes of motoring goodness. Most of the Vesterbro neighbourhood next to the Central Station would have been expropriated and torn down to create a spectacularly modern motorway exchange. The plan didn't stay on paper. 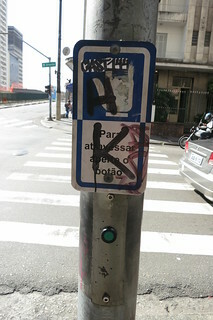 It actually left its mark on our city. Rows of houses were bought along Lyngbyvej and promptly torn down in preparation for the coming project and, farther out, many homes lost their front gardens. would have been sacrificed to become motorway and what is now Fredens Park along Fredensgade used to be buildings but they were bought up and torn down in 1973 to create the space for the motorway. On the other side of the street, the concrete, brutalist Panum Institut was built between 1971-1986 in anticipation of the project, as was the National Hospital's new buildings (built 1960-1978) as well. The Lord Mayor of the time was the ironically-named Urban Hansen and he was a declared modernist and fan of Le Corbusier. He was Lord Mayor between 1962 – 1976. Not so ironically he was the man who also single-handedly killed off the entire, proud and efficient tram system in Copenhagen, which served the city from October 1863- April 1972. Also on his CV in the housing development Urbanplanen (built 1965-1971)in Southern Copenhagen - named after himself - parts of which were classified as a "ghetto" in 2010. Basically, not a man you want to come back and haunt your city. If you've been to Copenhagen, chances are you've probably been to the Vesterbro neighbourhood. If you live here, you most definately have. 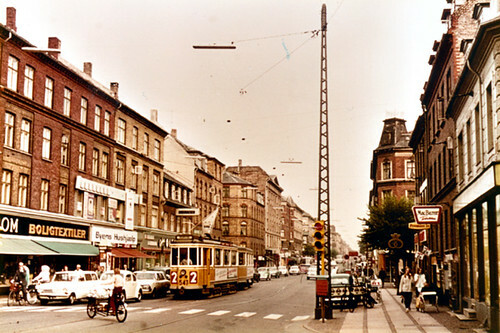 Above is the vision for the area of Vesterbro near the train station. A model of what it would have looked like if these projects were completed. An entire neighbourhood expropriated and levelled in order to create motorways and interchanges. Interestingly, if you've even wondered why the police station Station City on Halmtorvet looks so bizarrely out of place compared to the surrounding architecture, it's simply because it was also built in anticipation of the coming Søringen motorway project. The entire project was killed off in 1974 - more than 15 years after it was thought up. I wish I could say that it was political vision that killed it. Instead, the whole project lived on because there was never adequate funds for it. The oil crisis in the early 1970s intensified the protests against the project and you sense that it was put to rest extremely reluctantly. 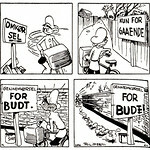 Fortunately, the development of Copenhagen from the mid-1970s took a radical change of course. The trams didn't return, sadly, but bicycle traffic was taken seriously once again and we re-established our high levels of bicycle traffic that we enjoy today because planners woke up and smelled the bicycle oil. We have, however, returned to the Age of Urban Hansen. City Hall has regurgitated the idea of a Harbour Tunnel. This tunnel really is Lord Mayor Frank Jensen's Søringen Project. That we're even having the discussion about it is sad. That so many politicians at City Hall back the project is shocking. 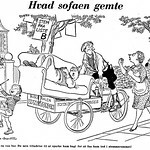 - "Cars have come to stay and they're getting cleaner and cleaner"
We hope this article will highlight our near-stupidity and prevent us from history repeating itself.